Is Your School Flunking the Arts? A new interactive dashboard allows you to take a closer look at the availability of arts education in California's middle and high schools. And the results? Well, let’s say there is still a lot of work to be done. The occasional sketch or music experience does not make the grade. If kids at your school get just a smattering of arts education, take a gulp and look at what is really required. It is not just drawing or music. 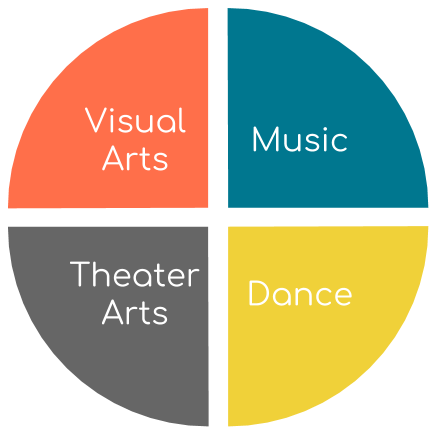 California law specifies that the arts should include instruction (grades 1-6) or courses (grades 7-12) in four disciplines: dance, drama and theatre, music, and visual arts. That’s right. All of these. 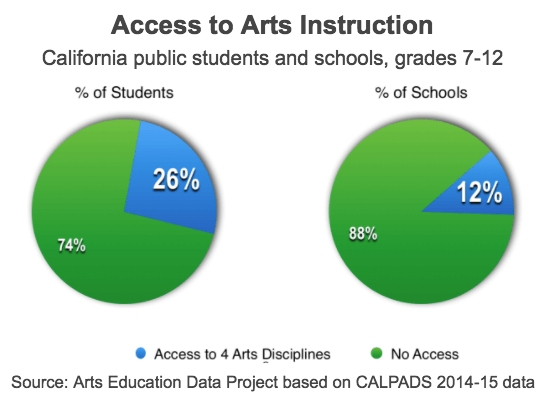 Most California students get some arts instruction. But few have access to all four required arts disciplines. It was not always this way. 86% of schools report offering at least one course in the arts. 39% of students are enrolled in some arts. Just 12% of California's middle and high schools offer all four arts courses. How well is your school doing? You don't have to wonder: Check here. If your school is one of the ¾ that doesn't have a full course offering in the arts, you might be wondering what to do about it. Hint: It does not happen overnight. It takes persistence, planning and a common understanding in your community that the arts are essential for every child in every school. The California Alliance for Arts Education (artsed411.org) is a great resource for information about advocacy efforts for arts education in California. [Editor's note: Carol once served on the board.] In 2018, this organization committed its support to the Arts for Every Student Incentive Grant Program (SB 933). The measure would create a competitive state grant program to encourage and maintain the delivery of high-quality visual and performing arts education programs and to provide a jump start for school districts lacking the capacity to provide access to arts for every pupil. You can find background information in this fact sheet . Because local school district budgets are crucial for arts education, community commitment is vital. It starts with parents, teachers, administrators and school boards understanding the importance of the arts to learning. You can start at your own school! SchoolSmarts is an award-winning family engagement program of the California State PTA that incorporates arts activities. One of its goals is to help families understand the importance of arts education. Find out how your school can participate. The SMARTS for the ARTS newsletter can help you stay informed. A parent meeting or family arts night is a great opportunity to discuss how your school and school district provide access to the arts—or don't. Share research on the the impact of arts on education. Americans for the Arts, a nonprofit organization, suggests some ways to get the point across visually. The PTA Reflections program gives students a chance to create and be recognized for original works of art and serves to increase community awareness of the importance of the arts to learning. Your school board could adopt the Declaration of the Rights of All Students to Equity in Arts Learning. Create CA recognizes districts and organizations on a statewide map of Arts Equity Districts and Champions. Your school district could get involved with the Arts Now Planning Initiative. This helps California districts and counties complete a planning process to assess, envision, and implement quality visual and performing arts programs for their students. Your school district could use Local Control funding and Title 1 Federal money to support student learning through the arts. Money. You can find support for the arts through community organizations, partnerships, and other strategies. But until there is sufficient funding for schools in California, the arts, along with many other programs, will continue to struggle. Some school communities have voted to support the arts and have made dramatic improvements in delivering arts to all students. San Francisco is a good example. But statewide, funding still is skimpy and that has a profound impact on what your school district can provide. You're probably right, Ken, but it's interesting how tricky it is to pin "proof" down. Learning is this weird combination of readiness, motivation, presentation and who knows what else. This post from KQED Mindshift caught my attention. It's nominally about the brain science of learning fractions, but I like the way it involves the idea of interest -- a motivated student recruits neurons to learn a task.